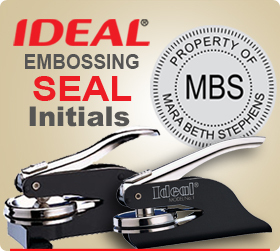 Personalized 1-5/8 in Embossing Seal in Desk or Hand Held Model. Custom Seal with Initials or word SEAL in Center. Seal cost includes the initials or letters. This Seal allows for an Individuals Name around the outer circle as shown, a line of data on the Lower Outer Circle if you choose and the Initials or word SEAL as shown in the middle. Choose either a desk model embosser or a hand held embosser.